Nothing beats seeing the glittering Las Vegas Strip on a helicopter tour! 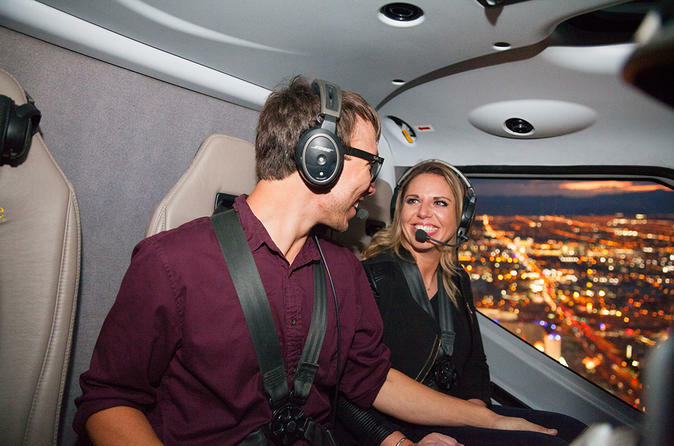 Soar over the Strip in an EC-130 helicopter and take in unbeatable, unobstructed views of Sin City icons like Fremont Street, Stratosphere tower, the High Roller Observation Wheel and the Bellagio fountains. Upgrade your experience to include limousine service between your hotel and the launch pad. Your tour starts with check-in at the local heliport located moments away from the Las Vegas Strip or you can upgrade to include limousine transfers from your Las Vegas hotel to the airport. After reviewing the safety features of your EC-130 helicopter, you'll board and strap in for a exciting 10- to 12-minute flight with a vantage point like no other. During the flight, listen to informative narration by your pilot on your two-way headset and you are welcome to ask questions. You helicopter flight starts as your fly North along the eastside of the Strip where you'll fly over mega resorts such as the MGM Grand Hotel, see the Eiffel Tower of Paris and the High Roller -- currently the largest observation wheel in the world. As you fly by the Stratosphere Tower, travel downtown to see Glitter Gulch and the Fremont Street Experience. On the return, you'll continue to soar over the fabulous lights of the Las Vegas Strip. Catch a glimpse of the dancing waters of the Bellagio fountains, the New York skyline and admire the Great Pyramid and Sphinx of the Luxor! All helicopters hold a maximum of 6 people and have large windows to maximize your sightseeing during the flight.